Never was much of a "cat person" until I met this little lady, Sable. As the Cat Fanciers' Association puts it ". 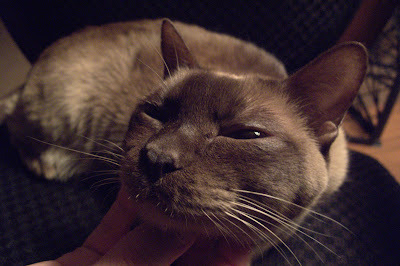 . . the Tonkinese is an intelligent, gregarious cat with a sense of humor. Their affectionate ways are impossible to ignore, and they quickly endear themselves to family and visitors." Canon G10, 1/20 sec at f/2.8, ISO 800 in macro (close focus mode).